Heartsdesire: Recommended Vaccination Schedule For Irish Children! Recommended Vaccination Schedule For Irish Children! Just a few days after Meg was born our local public health nurse came out to visit our family to check on the health of our newborn. She took out her file and proceed to give me the 'low-down' on all the recent health recommendations as indicated by the Department of Health. Firstly she advised me on the importance of administering vitamin D to our baby. I had learned just a few days earlier (from a medical professional) that the reason for this recommendation is that, as Ireland is becoming a more 'multi-cultutal' country, a lot of darker skinned babies were showing signs of vitamin D deficiency due to our lack of sunshine. However as our government could not be seen to single out racial minority groups they ran the 'vitamin D' campaign indicating that all babies were 'at risk'. 4 Months 6 in 1 (as indicated above) plus Meningococcal C.
6 Months 6 in 1 plus Meningococcal C and Pneumococcal. 13 Months Meningococcal C plus Hib. 11 to 14 Years Tetanus and Diptheria. Wow! Does that seem like alot to you? Me too! ...Our public health nurse peered at me over the top of her spectacles and said in a hushed voice "Do you know, I'm half inclined to agree with you"
I agree with Jackie. This is such a tough parenting decision. I don't blame people for not vaccinating at all. 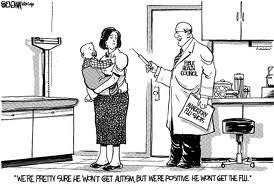 We've chosen to vaccinate, but with many reservations. When we go in for vaccinations, we make them do their research to make sure they are giving us mercury-free vaccinations. We refuse flu vaccines though. With my husband in the military, he is required to have vaccinations and the flu vaccine makes him sick every time. This is such a tough decision. I pray for safety and wisdom anytime we have to go in for a vaccination.